And the winner is…..Steph! Enjoy your cards! Whether you are a business person, a high-profile blogger, or a mom scheduling play dates, I think we can all agree that business cards are an essential these days. It is the best way to pass along your contact information. Stash a stack in your purse, laptop bag, or wallet and you’ll always have your information ready to hand out when you meet someone new. 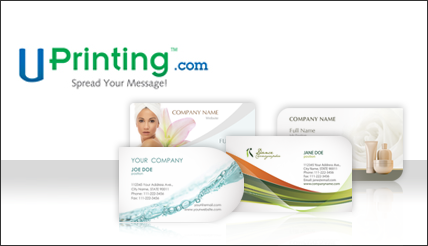 UPrinting.com has some of the best business card options I’ve seen. You can use one of their pre-designed cards or create your own unique design. They have both standard and die-cut options, but I have to say I’m a sucker for the die-cut cards. I just love those rounded corners! So that you guys can check out just how awesome UPrinting.com is, I have 250 die-cut cards to give away to one lucky reader! How to Enter: Leave a comment below telling me you want the cards. That’s it! Just make sure to leave an e-mail address where you can be contacted if you win. The not-so-fine print: This is a quickie, so get your entries in now. Contest will end Monday, October 4, 2010 at 11:59 pm. One winner will be selected by random.org and notified via e-mail. Keeping the FTC happy: In exchange for hosting this giveaway, the author has received 250 business cards of her own from UPrinting.com to try out the service. Would love to try these out! I’d like to see the round ones and put my watermark stamp on it! I would like the cards to help promote my graphic design business. Thanks for the opportunity!